As I was growing up in the Yellowstone-Teton nook of the Book of Mormon belt that arched from southern Alberta, Canada to Mexico and sweeping over Las Vegas to San Bernardino, a claim was often heard among the million adherents at that time that the federal Government had copied the Mormon welfare system. That has never been substantiated, but both systems did both tap into some common lineage before coming of age during the mid-1930s and the Great Depression. While they may not have crossed paths, within a little more than a year the entrepreneurs behind each plan had volunteered at Chicago’s Hull House, a turn-of-the century outcome of the Progressive movement and were mentored by its founder Jane Addams. Amy Brown Lyman, who would go on to lead the Relief Society, a Mormon women’s auxiliary, stopped in Chicago during the summer of 1902 on her way east during her husband’s sabbatical and not only took a class at the University of Chicago in the relatively new subject of sociology but also volunteered at Hull House. After accepting a teaching position in 1904 in Lake Forest, Illinois, Frances Perkins volunteered for Addams at Hull House before becoming a cabinet officer through all four terms of the Roosevelt administration and championing the Social Security Act of 1935. Thanks to written and oral histories left by a slightly younger contemporary, my great aunt Vera White Pohlman, the full story of Amy Brown Lyman’s contributions have re-emerged and informed scholarship such as that by Dr. David R. Hall of Cal State Fullerton. When she returned to Utah from that sabbatical, Lyman lobbied passionately for creation of a social welfare department in the Mormon Church which she led for many years after its creation in 1919. 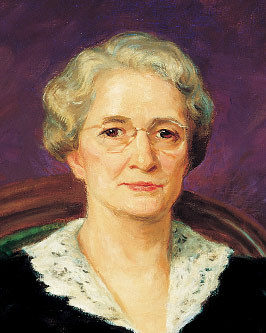 She even won election to the state legislature in 1922 to champion Utah’s participation in a nationwide program to promote infant and maternity care as well as establishing a hospital and a training school for the mentally disabled. The common struggle shared by Perkins and Lyman was how to scale up social welfare to the size needed to truly address the magnitude of the challenges. Republicans then as now opposed any role of government, hoping instead that disparate private agencies would somehow suffice. Lyman was famous for reaching out to both non-profit agencies as well as local and state agencies to leverage efforts by the Mormon Church until behind-the-scenes lobbying among male leaders finally forbid it. The mastermind behind that move was a former Hoover administration official, J. Rueben Clark. Perkins succeeded and so did Lyman in a way. Mormon leaders who disparaged Roosevelt programs as the “dole” when they were launched in 1935, created an “inversed projection” by creating a “dole” of their own in 1936 by gathering, standardizing, centralizing and reinventing a number of programs including Lyman’s while freezing her out of the process. Unfortunately, the program was hampered by politics, both gender and ideological, including a condition that can lead “individuals or groups to subconsciously rationalize a contradiction in their own self-conception by painting themselves as the victim instead,” something hardly unique to Mormons and often witnessed in news stories today. But as effective as the 1936 Mormon welfare program was back then and as remarkable as it has evolved into today, it was no match for the scale of hardship during the Great Depression. Statistical reports by federal officials at the time document that the by-then isolationist Mormon welfare program didn’t come anywhere close to making Mormons along the Rockies self sufficient from the federal programs nor were pioneers such as Lyman unaware of the problems associated with the inevitability of increased government involvement. Church members weren’t officially reauthorized to leverage efforts with those of other public and non-profit agencies until approximately 1991. What is increasingly apparent to many experts today is that far too many social welfare programs are not cost/effective. They have lost the nimble and innovative characteristics with which they were inaugurated and long ago it became too expensive to provide recipients to work volunteer in return. Too much time is wasted on attacking or defending rather than just cutting ineffective programs, trimming waste, eliminating fraud while also increasing funding for innovation and research for those programs that are effective. All of this should be informed by the growing scientific evidence about human interactions with incentives including sense of entitlement. Infographic – What’s Wrong With Our Food System?